native soil for the sailors. 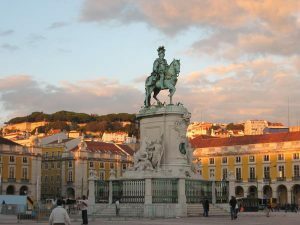 It is regarded as the monument in Portugal that indicates towards the age of Discovery. The Belem Tower serves as the symbol of the entire Portugal. The spot has been enlisted in UNESCO as a World Heritage Monument. The Belem Tower has been built in the Manueline style which inscribes several stone works ornamentations of the discovery. Sculptures present in this edifice of history include the depicting figures of history. Some instances of the stonework in the tower are the historical figures of St. Vincent, the interesting art piece of rhinos which was inspired by the drawing of the beast by Durer. The renowned architect of Poland – Francisco de Arruda, had already worked on several forts of Morocco. They are all in the Moorish – style and hold the Moorish influence. This is the reason why this edifice is different from other ones of its kind. The tower had a famous effigy of Virgin and the Child built in the 18th century, Our Lady Safe Homecoming: constructed into the terrace of the Bastion. The corners of the tower are enriched with the sentry posts. The entry to the appealing museum is via gangway. The next way that may suit you is through the drawbridge and the bulwark. The terrace of the tower offers you a splendid view of the western part of Lisbon. You can also view the beautiful river that flows across the area from the terrace of the Belem Tower. The Gothic burial chamber which is evident in the casemate of the tower is the symbols of the Manuel’s Military power which was contributed to the military conquest in that era. The Armillary Spheres that appear at the entrance hall of the tower symbolizes towards the nautical explorations in Portugal. The armillary sphere was the personal banner of the king Manuel 1st. It represented the explorations of the Portuguese in his reign. The Belem Tower has a decorated, carved, twisted rope with chic knots which point toward the nautical history of Portugal. I am sure that you will enjoy your time at this spot. So do not miss the visit to this place if you ever seek to Portugal.